On Kauai, I was once attacked by a swarm of mosquitoes in a small forested area. I was only trying to take a ten minute walk through a wooded path on my way to a beach. Unfortunately, I wasn’t wearing mosquito repellent. I got about 100 yards into the path and realized that I might not have any blood left if I continued on the path. (Okay, that was a bit of an exaggeration.) So, I ran out of those woods as quickly as I could. Unfortunately, I never made it to that scenic beach, but I had plenty of itchy red splotches to remind me of the attempt. Unless you like the look and feel of itchy red splotches on your arms and legs, you’d be wise to be prepared to repel mosquitoes on your Hawaii vacation. Now, please don’t get me wrong. You are not going to get mosquito bitten the moment you step out of the airport. You just need to be prepared in case you plan on doing any hiking or exploring in wooded and rain forest areas. You’ll definitely need mosquito repellent there. We all know that DEET is a very effective mosquito repellent, but it usually doesn’t feel nice on my skin. It feels greasy and not very breathable to me. Who wants to feel like they’ve slathered butter all over their body when they’re out for a hike? I read in Adventure Magazine that DEET can be a skin irritant and can even melt plastic. (Yikes!) DEET products usually don’t have a very nice fragrance, either. I recently came across some new mosquito repellent products and strategies that I thought were interesting. I wanted to summarize these new DEET alternatives here. Picaridin is a relatively new insect repellent that is an odorless, non-greasy feeling alternative to DEET. It has been approved by the CDC as an effective protection against mosquitoes that may carry the West Nile virus. Avon (Skin-So-Soft Bug Guard), Off! (Skintastic Family Care Clean Feel), and Cutter (Cutter Advanced Insect Repellent Wipes and Sport Aerosol Spray) make product that contain Picaridin. Permethrin Concentrate is for use on clothing, tents or netting. It is safe for use on children’s clothing. The active ingredient (Permethrin) actually binds to the fabric being treated and is completely odorless after application. It is safe for use on natural and synthetic fibers. This treatment provides six weeks of protection. One 8 oz. bottle will treat 16 complete sets of clothing. Protection will endure through 6 launderings. Permanone is another product that appears to have Permethrin in it. I found this product that you can use to spray on your clothing to provide up to two weeks of protection. The product description says that it “actually kills insects that come in contact with it.” Does this raise any red flags with you? I have to admit it makes me nervous. One caution I’ve read several times about Permethrin and Permanone is that you should never spray it directly on your skin. In shops that sell hiking and camping gear, you can find clothing that is pre-treated with Permethrin. ExOfficio is one brand that makes mosquito repelling clothing, though after 25 launderings or so, the treatment will wash out. I’ve not tried repelling mosquitos with treated clothing. Have you? I wonder if you must wear a long-sleeved shirt and long trousers for it to work? If you wore shorts and short-sleeved shirt would there be enough of a repelling smell to ward off the mosquitos? Would there be too much exposed skin to tempt the skeeters to take a bite? There is a product named Repel that is made of lemon eucalyptus oil that you apply to your skin. It’s sold in spray and lotion forms. It is claims to last up to six hours. I’ve used the spray form and it seemed to work. The product has a greasy feeling and it has a heavy eucalyptus fragrance. So, other than the fact that it’s made from a renewable source, there’s not much of an advantage of using it over DEET products. When I saw that the plant based product was plant based, I assumed that it was completely safe to use, however, there are precautions about using it. It is harmful if swallowed. After you have applied Repel, you are advised not to eat, drink, chew gum or use tobacco until you’ve thoroughly washed your hands with soap and water. When you out backpacking and hiking, it’s not always possible to thoroughly wash your hands after applying mosquito repellent. Another precaution to be aware of is that it is not advised for use on children under the age of three, where as DEET and Picaridin can be used on children as young as two months. I found some reviews of Repel lotion on Epinions.com. So, take a look at what others have said about using Repel. Cutter, a maker of insect repellents, has a pretty good comparison of the various repellents that you apply to your skin. Click here to see that brochure. Have you tried any of these products or methods? 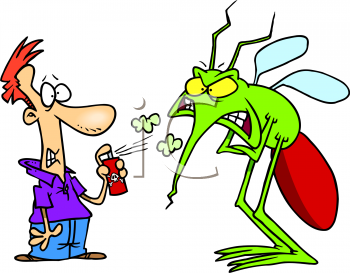 What insect repellent do you use? Do any of these DEET alternatives interest you? I just tried Off! Family Care Clean Feel with Picaridin on a hike through a thick rainforest on the Big Island this week. Though I saw many mosquitoes, my husband and I survived the hike bite-free. Yay! I hope you’ll find an effective product to help you prevent mosquito bites whether you plan to hike in Hawaii or spend an evening in your back yard this summer. Let’s find a way to stay bite-free. The best Natural Insect repellent i have ever used on my family was from Hawaii. secondskinnaturals dot com its really great ! Thank you for posting that info! I’m going to Kaua’i in Febuary and the mosquitoes love me.